No one at Wichita knew what to make of Keith Callison at first. He showed up in September, saying he’d pedaled his bicycle from California to Kansas by way of Tulsa. Sixteen hundred and 40 miles, give or take. He said he came here because the Lord told him to. And because he wants to make airplanes. He said he had no job. No high school diploma. He said his last home was in Escondido, in somebody else’s garage. He said he fished his well-worn Schwinn Beach Cruiser bicycle out of his ex-wife’s garbage dumpster before his long ride. And he said that until Aug. 9, he was smoking a whole lot of weed and crystal meth. He baffled people at first. Since September, Callison has earned a perfect 4.0 grade-point average in four courses on aircraft composite manufacturing, all taken since he arrived at Wichita Area Technical College, WATC’s president said. Tech courses for aviation work are hard for anyone, let alone a 53-year-old former meth user who got his GED only weeks before. But Callison thrived. “He was so grateful,” said Sheree Utash, WATC president. “He would ride his bike several miles every morning from the Union Rescue Mission to NCAT (the National Center for Aviation Training), where his classes are, and he’d watch the planes taking off from Jabara Airport. Utash believes in him so much now that she’s helping him get scholarship money to stay in school. Utash met Callison almost immediately after he rolled into Wichita. He’d ridden all the way from Escondido to Tulsa (1,465 miles) because he heard they taught aviation manufacturing at the Spartan College of Aeronautics there, he told people. Callison says the Spartans were nice to him until the moment he told them he had no high school diploma. He rode the Schwinn 175 miles to Wichita, sleeping under an overpass on the way, as he says he’d done all the way from Escondido to Tulsa. He talked so brightly about airplane making to school officials at WATC that he soon found himself facing Utash in the president’s office. She listened to Callison, suspicious at first; the story sounded so improbable. But the more Callison talked, the more intrigued she became. She asked where he was sleeping at night. “Under overpasses or at truck stops,” he said. He’d slept in those places on the road all the way from Escondido, he told her. He said he wants to build airplanes. Becoming an airframe and power plant certified mechanic would take perhaps two years, she told him. She told him to apply for meals and a bed at the Union Rescue Mission in north Wichita, a nonprofit charitable home for homeless men. Callison is now living there. Then, with Callison sitting there with her, Utash called Gayle Goetz, who runs an adult learning program called NexStep for Goodwill Industries in Wichita. “Gayle,” Goetz recalls Utash saying. “I’ve got a very interesting guy here who wants to learn aviation manufacturing but has no diploma or GED. At first, Goetz looked at Callison with the same professional suspicion that Utash had felt. Was he trying to scam everybody in Wichita and pass himself off as a safe and good man so that he could get a job? Did he really bicycle all the way from California? “How did we know he didn’t just ride his bike into here from Andover?” Goetz said. At first, Goetz said, none of this mattered: Callison wanted a GED. NexStep helps people get GEDs. So Goetz set up Callison with the required coursework and tests. She told Callison, trying to let him down easy, that getting the GED might be a struggle, involving many months. BRING IT ON. I’LL DO ANYTHING. He blew through all the coursework and tests in two months. By that time, Goetz and others at NexStep had taken a good, long look at Keith Callison. And so had Utash, who set him up with WATC courses that he took concurrently with his GED work. And so had Denny Bender, the director at the Union Rescue Mission. Goetz and others at Goodwill became so intrigued by his enthusiasm that they began to go out of their way to help him. And so when a job came open, managing the donation door at the Goodwill store at 37th and Oliver, Goetz told him to apply for it. But Goodwill requires a criminal background check. And it was after that check that Goetz and others began to think that Callison is for real. The background check on Callison showed only one DUI charge from 2006 – and no other criminal charges. He was relatively clean, as he’d told them. The story that he told about living all his life in California also turned out to be true. “Every one of his contacts from his past, all the places he’s lived, are in California, where he says he’s from,” Goetz said. The only reason they knew Callison has had a substance abuse problem (for decades) is that Callison himself told them. Biking from Escondido, Calif., to Tulsa, Okla., is mostly a long, hard ride through mountains, with the Mojave Desert and the dry and hot Oklahoma Panhandle thrown in. Callison said he did the whole ride in 17 days, from Aug. 9, when the Lord first spoke to him, to Aug. 21, when he arrived outside the doors of Spartan. He said he prayed to the Lord nearly all the way here. Just before he left, Callison said, his granddaughter Melody gave him a small, stuffed gray Care Bear. 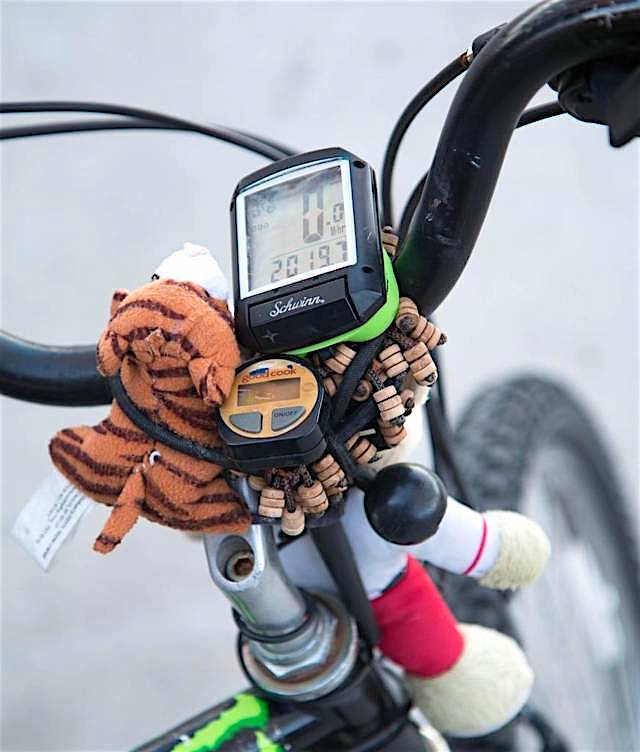 He tied it to his handlebars, where it rode alongside a stuffed miniature Tigger doll, all the way from Escondido. On average, he said, he rode his Schwinn Beach Cruiser from 110 to 115 miles a day. Did he really do this? No one saw him do the whole thing. But if you Google “bicycling long distances,” you will see that this is at least possible. “Century rides” are what the more daring bicyclists do when they ride 100 miles in one day; some cyclists do century rides day after day, just for fun. Callison said the ride to Oklahoma was mostly downhill once he reached Arizona. There was one near-death experience, he said. THE MOJAVE DESERT AIN’T NO JOKE, LET ME TELL YOU. He got heat stroke there, he said. He could not reach anyone by calling 911, but he reached his ex-wife, who called local authorities. The ambulance crew tried to leave his bicycle on the side of the road when they came for him. He says he left Escondido with no money, “because the Lord told me he’d take care of me.” On the way, he said, he slept under overpasses or at truck stops, where he sometimes used his food stamps to get food, and where he also approached one trucker after another. After he got the job at Goodwill, the weather in Wichita turned vicious. Snow. Ice. Temperatures below freezing. Goetz noticed that Callison was still riding the bike to work and to school, mile after mile every day, in the dark, in rain, in freezing cold. She tried to offer him a coat. She bought him a bus pass, which he apparently has not used. She tried to offer him a ride during a recent snow, offering to put his bike in the pickup truck bed and himself in the cab. “There are many people more poor than I am,” he explained later. “I don’t want to take help they need. AND ANYWAY, THAT BIKE, IT’S MY HORSE. “And anyway, that bike, it’s my horse. And I needed to know how it will handle on snow and ice. Goetz and Utash, when they first met him, when they first heard his almost improbable story, were naturally wary. They still wonder how his story will turn out. But they think they’ve gotten a glimpse of what kind of man Keith Callison could be. “There’s something about this guy,” Utash said. “The minute I met him, I saw it: He’s so upbeat about everything, about everyone around him. “He came here not knowing anyone. He had almost nothing,” Utash said. “He’s done very well so far. “I got a voice mail from him on Christmas Day. ‘Merry Christmas,’ ” Utash said. “He rides every day when he goes to school and gets to where he needs to go long before the other students arrive. And he takes those photographs outside the Jabara Airport, of the airplanes taking off, and the sunrises. LOOK WHAT GOD HAS PROVIDED FOR ME TODAY. “He sent me a sunrise photo one morning. 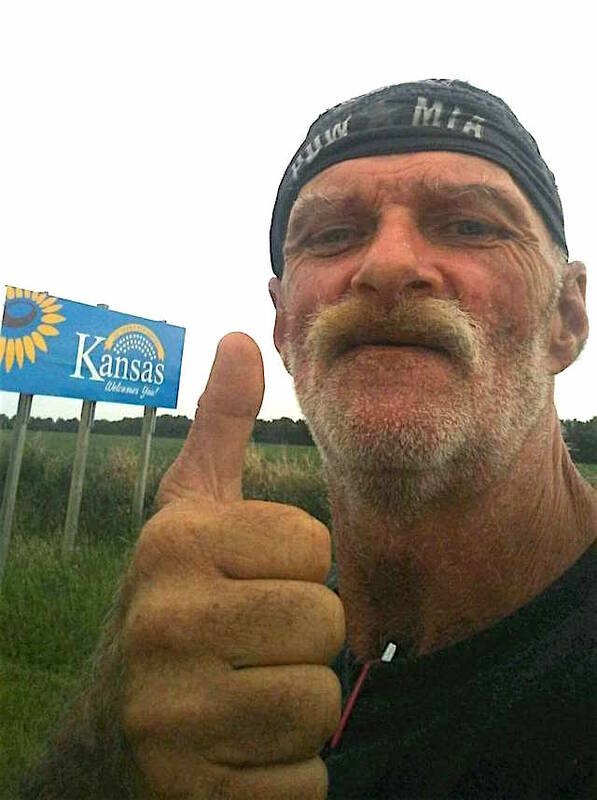 Be the first to comment on "All the way to Wichita: Homeless Escondido man rides bike — and vision — 1,640 miles"